This branch of gymnastics is one we strongly recommend to boys. In using the clubs the chest is expanded, – greater freedom is given in the use of the arms, the muscles of the legs and arms as well as those of the whole body are brought into full use, the wrist is strengthened, the grasp of the hand is made firmer, the circulation of the blood is regulated, and the health in general is greatly improved. If their use is persevered in, they will render the person who practises with them ambidextrous-that is to say, he will be able to use his left arm almost as well as his right in hurling, flinging stones, lifting weights, and similar operations. 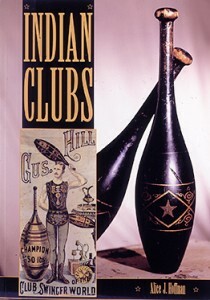 Below, you can watch historical footage showing traditional Indian club swinging. Club swinging was reintroduced to jugglers in America by Michael Moshen and Allan Jacobs. Allan won the US Nationals competition at the 1983 International Juggling Convention with a club swinging and juggling routine, thus inspiring many other jugglers to learn. Below, you can watch a street performer named Swing demonstrating her club swinging skills on the streets of São Paulo. In the 1970s, American engineer and mathematician Claude Shannon invented the world’s first juggling machine. His machine, which was made from an erector set, used a bounce juggling technique to keep a three-ball bounce cascade moving. Bounce juggling was the preferred method because the ball is caught at the top of it trajectory, when it’s not moving. Below you can watch Shannon’s machine on a 1985 Canadian television show. Since that time, however, there’s been little progress in making machines juggle–until now. Below you can watch Mark Muller and Sergei Lupashin operate a quadrocopter, which is a remote control helicopter-like device, maintaining a single ball aloft by bouncing it while in flight. Watching the video, it’s easy to see how another ball or two could be added to the pattern. This is cause for alarm. Will juggling machines render human jugglers obsolete? Dubé Juggling﻿ is proud to announce our annual Holiday Sale! 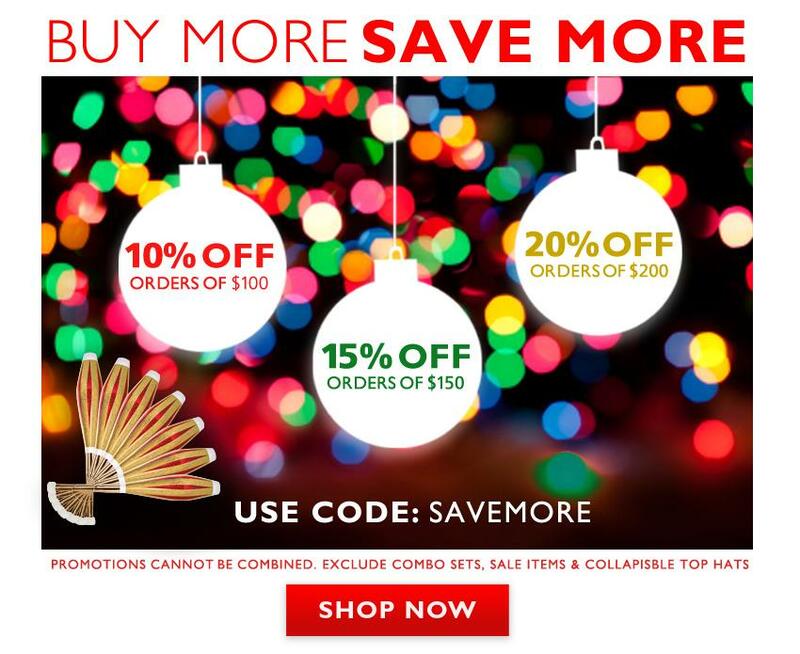 Now through December 12th, use the promo code SAVEMORE to save 10% off orders over $100, 15% off for orders over $150, and 20% off orders over $200. Offer excludes gift certificates, combo sets, sale items, collapsible top hat and silicone balls. Offer cannot be combined with other promotion. This is Japanese juggler Nobuharu Sato performing a very unique juggle act featuring an array of objects. Sato’s performance is reminiscent of routines by Michael Moschen and Greg Kennedy, but features some very innovative concepts. Hat tip to Ministry of Manipulation for posting the video. Sesame Street first aired 40 years ago, and has featured such universally recognized characters as Elmo, Big Bird and Cookie Monster. However, one character you may not be aware of is Dexter the Juggler. Dexter appeared in only two segments in the 1980s, and was manipulated by Kevin Clash, who controlled the head, and juggler Fred Garbo, who controlled the hands. If the name Fred Garbo sounds familiar, it should. Fred is an American juggler, clown and vaudeville performer who has been performing since 1974. He was one of Brian Dubé’s first customers in the mid 1970s, and has been a regular at the store ever since. He has performed across the world, and currently operates the Inflatable Theater Company. I puppeteered the head of the character and we found a talented artist named Fred Garbo to do the juggling while squatting under the camera’s frame. Talk about tough! Trying to coordinate Fred’s actions was next to impossible. Fred was the best, but this was asking too much. We spent most of our time in rehearsal rounding up dropped balls, stumbling over one another, and flubbing lines of dialogue – just try concentrating on what you’re saying when you’ve got balls flying around your head. Even though Dexter only appeared in two segments of Sesame Street, his memory now lives forever thanks to the magic of YouTube. Below, you can watch Dexter in action. In the first half, Dexter juggles three and four balls. 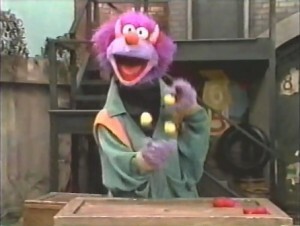 In the second, Dexter teaches the Sesame Street character Gordon how to juggle. Baseball has the Yankees and Red Sox. Gangster rap has Tupac and Biggie. Juggling has Chris Bliss and Jason Garfield. For those who don’t know, Chris Bliss is the star of the first truly viral juggling video. The video features Bliss, a juggler and stand-up comic, performing live interpretive juggling to three songs by The Beatles. The video was an instant success, garnering millions of hits overnight. This confused many in the juggling community. The routine featured very basic three-ball juggling, intermediate level at best. While the video may have been entertaining to the layman, it certainly doesn’t match up to the skill displayed in other YouTube videos. Enter Jason Garfield, one of juggling’s foremost technicians. Garfield designed a routine mimicking Bliss’ every move but with 5 balls instead of 3. Garfield even ripped the audio track off of Bliss’ video, complete with applause from the audience. His routine was also a success, although it did not win as many views as Bliss’ routine. Now, because of the power of the YouTube Doubler, we can watch both routines at the same time. Click here to watch both videos simultaneously. 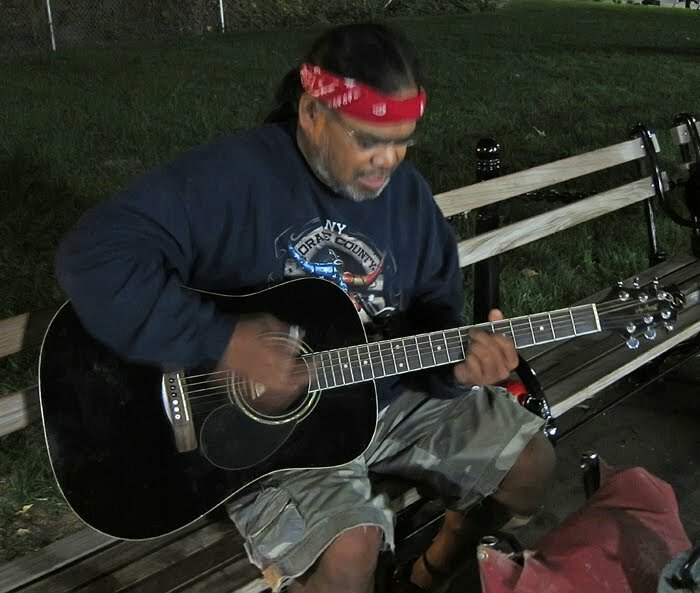 In a typical evening ritual, I circumnavigated the central plaza of Washington Square Park looking for a music jam. I had a number of choices but I was drawn to this particular man who I had never seen before. He looked like a man passing through. His voice was very good, his playing style confident and his repertoire quite extensive. The more I listened, the more I liked him, so I decided to make a commitment and sit down. I took a few photos…. 1) Watch the show with us. Space is limited. Doors open at 11 am. Direction are here. 2) Watch the live stream online from our website. Tune in around noon, eastern standard time. Do you have a juggler in your life? Are you in love with a unicyclist? Looking for a gift for your little daredevil? 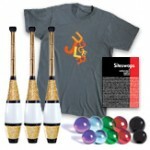 Gift Guides from Dubé Juggling has just what you’re looking for. Gift Guides make it easy to shop by category. We have gifts for beginners, serious jugglers, kids, contact jugglers, unicyclists and daredevils. To make things even easier, we’ve also sorted gift ideas by price. Choose from gifts under $25, gifts under $50, and gifts under $100. Think Congress is a circus? Think again! Another election day has come and gone, as Americans wait for a new group of leaders to take over. The 2010 season has been particularly divisive; extreme rhetoric on both sides of the aisle has converted Congress into a bicameral three-ring circus. While we might object to the behavior of our elected officials, whatever you do, DON’T CALL THEM CLOWNS. Not in front of Keith Nelson anyway. 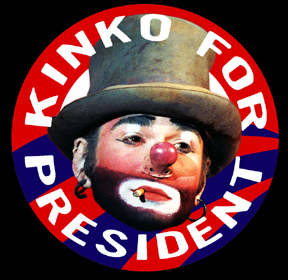 “If you look at the history of the American circus, you’ll find that it’s one of the most efficient and well-run industries,” says Keith Nelson, also known as Kinko the Clown of the Bindlestiff Family Circus, a New York City-based group that has traveled the world. In the clip below, members of the Bindlestiff Family Cirkus discuss their feelings on the matter, and Kinko discusses his political future. Dubé Juggling is proud to announce our newest DVD offering. Marcus Monroe: The Complete Second Season features Milwaukee native and inventor of the Knorch™ as he juggles and unicycles his way out of the Badger State and into our hearts. 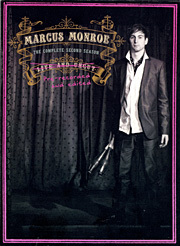 Throughout the DVD, Marcus interlaces supreme technical juggling skills with showmanship and his trademark deadpan and offbeat sense of humor. Watch as Marcus juggles five flaming torches. Marvel as he rides a twelve foot unicycle with his head on fire. Be amazed as he sings a rap song about his favorite breakfast cereal (Cinnamon Toast Crunch). The DVD includes a complete live performance, a step-by-step juggling tutorial, a highlight reel, plus tons of bonus footage. But that’s not all! Marcus is starring in his own one-man off-Broadway show. This Friday and Saturday only, get tickets to see Marcus Monroe: Live in NYC and see why The New York Press calls Marcus “the rockstar of jugglers”. Click below to watch a preview of his show.